Derbyshire is an incredibly popular tourist destination and our hotels in Derbyshire are perfectly placed to enable you to explore all it has to offer. Belper is a historic market town located in Derwent Valley Mills Heritage Site which is famous for its cotton mill history. It is the perfect place to relax and explore and there are a wide selection of attractions for you to visit and see when staying at our hotels in Belper. In Belper itself you can visit that Heage Windmill or Strutts North Mill for a taste of industrial history. Tours are held throughout the day and give you a real insight into the industrial past of the Derbyshire area. Definitely worth a visit! If you’d prefer something relaxing, our hotels in Derbyshire such as The Lion Hotel is located very close to Belper River Gardens, these Victorian Gardens are great for a picnic in the summer months, or leisurely stroll all year round – feed the ducks and enjoy the views. If you’re looking to go a little more further afield, Belper neighbours Ashbourne, Ripley and Matlock, make our hotel in Belper the perfect base to explore natural beauty spots such as Dovedale and the rest of the peak district. There are many opportunities for walking, hiking outdoor activities and exploring the natural beauty of the area. After a long and interesting day in Derbyshire there’s nothing better than getting back to our luxury hotels in Derbyshire. You can enjoy a delicious meal from a gastro pub menu, or one of our traditionally made stone baked pizzas from one of the leading pizza restaurants in Derby and enjoy a drink in our newly refurbished bar area. After you’re full and content you’ll retire to one our incredible 22 rooms with modern amenities. 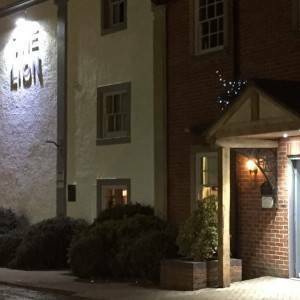 You’re assured of a relaxing stay and the warmest welcome at The Lion Hotel Belper. If you have any questions, please don’t hesitate in contacting us, a member of our team will be more than happy to help!